Since the middle of the 19th century, after having suffered repeated defeats by foreign powers, more and more voices in China demanded revolutionary changes and stressed the need to learn from the outside world how to make China strong. It was under such circumstances that the Methodist Episcopal Church, one of the most influential churches in America, arrived in China to start its missionary and educational programs. In 1879 and the years following, the Church founded the Buffington Institute and the Kung Hang School in the city of Soochow (now spelled Suzhou), in Jiangsu Province, and the Anglo-Chinese College in Shanghai. 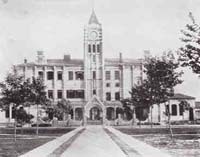 In 1900, it was decided that the three schools should be merged and form a university, set up at Soochow. In December 1900 the charter of the university board of trustees was drawn up, and Dr. Young J. Allen (founder of Globe Magazine) was appointed Chairman of the Board and Dr. David L. Anderson university President. This was the birth of the first private university in China. In its first 26 years, Soochow University had three American national university presidents, David L. Anderson, John W. Cline and W. B. Nance. On the campus, several buildings, the Lin Hall, the Sun Hall and the Ge Hall, and others for faculty and student accommodations were constructed. The courses provided by the university were in the fields of the humanities (liberal arts), science, medicine, theology, and law. In addition, four affiliated high schools and twenty affiliated primary schools, and then the Huihan Primary School and the Wu Yu Institute, were also part of the educational system of Soochow. The school motto, "Unto a Full-Grown Man,” was chosen to stress the importance of developing the integrity of the students. Through the successive efforts of the three presidents during this period, a solid foundation was laid for further developments. The May Forth Movement in the 1920s and 30s aroused the patriotism in Chinese intellectuals, and Soochow University took steps to implement localization. In 1926, the mandatory religion courses were abandoned. Subsequently, the Board of Trustees was restructured, and two-thirds of its members were filled with Chinese nationals. In 1927, Dr. Yang Yung-Chin was appointed the first Chinese president. He announced that the Chinese version of the school motto, to reflect the English motto "Unto a Full Grown Man,” should be the couplet養天地正氣‧法古今完人, which in English means "Nourish the spirit of universal morality and emulate the perfect men of all ages.” In 1929, the National government in Nanjing officially approved the establishment of the school, registered as Soochow University. By 1930, the university had three colleges, the College of Liberal Arts, the College of Science and the College of Law, comprising 12 departments, and the number of students, 755, topped all those of church-established universities in China. The year 1937 saw the beginning of the War of Resistance Against the Japanese. In the following eight years, the school’s operation both on the Soochow and the Shanghai campuses was undermined by the war. The two campuses were either moved individually or joined up with other universities. With the Japanese surrender in 1945, the teaching faculty and students could finally return to the campuses to start the laborious task of bringing back order to the university. In 1952, the Chinese Communists government implemented adjustments for the colleges. The Soochow Law College in Shanghai was incorporated into the Political Science and Law College of East Chinese University; the Accounting Department was merged with the Shanghai Finance and Economics College; and the Liberal Arts and Science Colleges in Soochow were taken over by the Southern Jiangsu Teachers College. 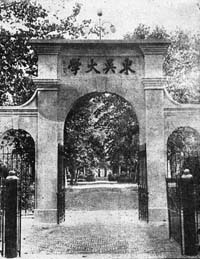 In December 1952, the Southern Jiangsu Teachers College was renamed Jiangsu Teachers College, and in 1982, the same College reorganized and renamed Soochow University. In the autumn of 1949 the Nationalist government was relocated to Taiwan, and a group of alumni of Soochow University, who also came to Taiwan, proposed to reactivate the university in Taiwan. In 1951, a preparatory school board was organized, which then rented premises on Hangkou Street in downtown Taipei to set up Soochow Preparatory School. 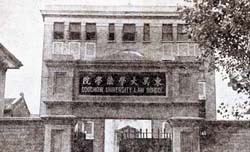 In 1954, the Ministry of Education granted permission to reorganize it as Soochow University Law College, consisting of the Departments of Law, Political Science, Economics, Accounting, and Foreign Languages. 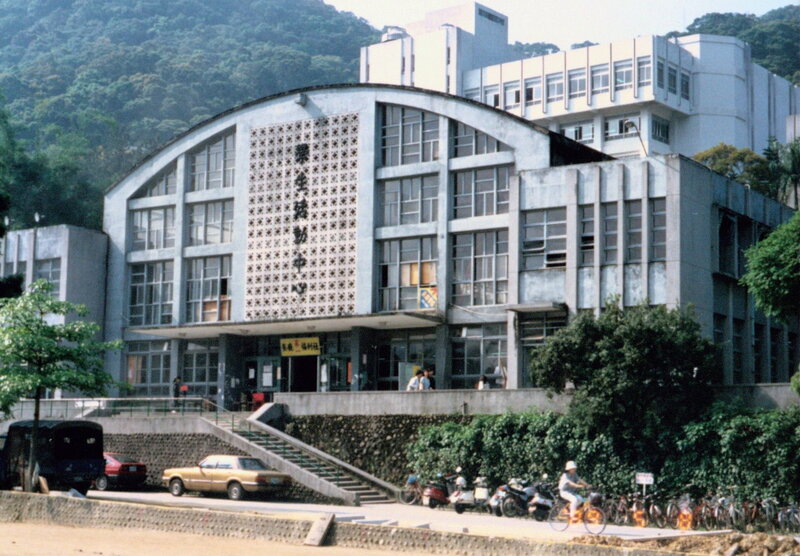 It was the first private school on university level set up in Taiwan. 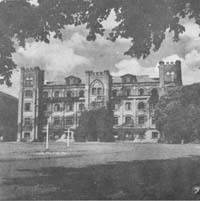 In 1957, the university purchased land in suburban Waishuanghsi. In the same year, Dr. C. Y. Stone (Shih Chao-yong), an alumnus of Soochow University, was appointed Dean of the College. 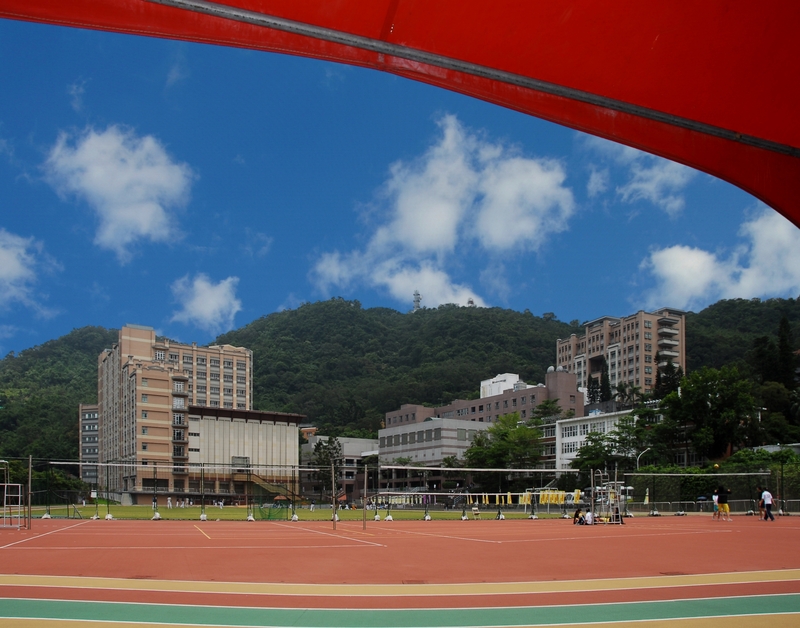 Within two years, two buildings, the Wang Memorial Hall and the student activity center were completed. In 1961, the university could move from Hangkou Street to the current address in Waishuanghsi. Soochow finally had a beautiful campus of its own. The early years of reactivation in Taiwan, however, were not without difficulties and setbacks. The financial situation of the school was very critical. Nevertheless, with the school board’s endeavors and donations from alumni and churches at home and abroad, the university stood firm and could continue its educational work. The first two decades after moving to the Waishuanghsi campus were crucial for the growth of Soochow University after its reactivation in Taiwan. Dr. Stone, Dean and then President from 1957 to 1968, was greatly devoted to raising the academic standards during his term in office, laying a solid foundation for the university in this respect. In 1969, the Ministry of Education approved that the university resume its status as a full university. Subsequently, Dr. Joseph K. Twanmoh, President from 1969 to 1983, had great achievements further actively developing the university. During his term in office, 12 new departments, 7 new graduate schools, and 3 new doctoral programs were started, and the Chiang Kai-shek Memorial Library and a number of main academic buildings were successively constructed. He also started the Downtown Campus on Kueiyang Street, Taipei City, where two buildings were erected. More and more outstanding young men and women were educated and had graduated from the university, and the school’s superb teaching performance has been well acknowledged and deeply appreciated by the members of public. After the efforts of two decades, Soochow University has now turned into a fully developed university. Entering this phase, Soochow University has already expanded into two campuses. 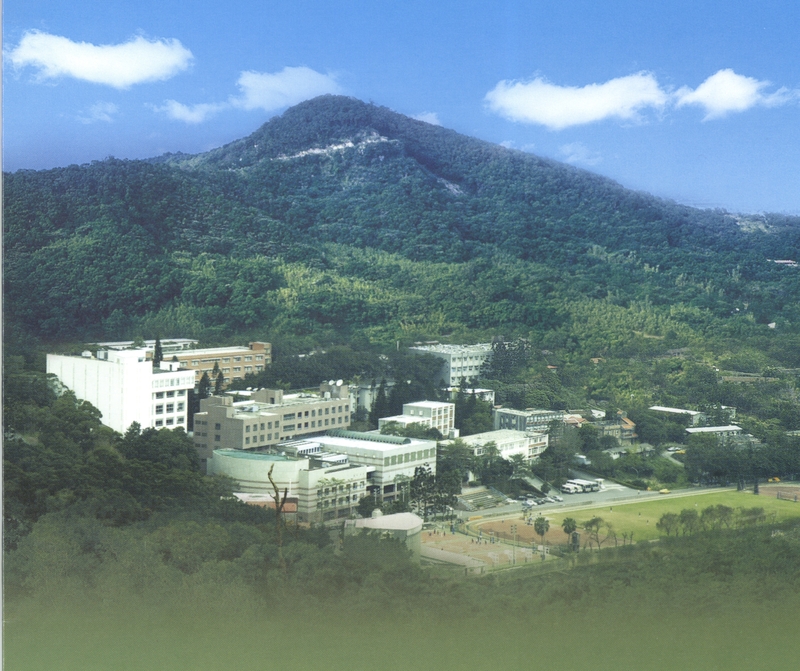 The Waishuanghsi Campus is situated in a scenic cultural area, housing the School of Arts and Social Sciences, the School of Foreign Languages, and the School of Science. The Downtown Campus is located in the political, economic and cultural center of the city, housing the School of Law, the School of Business, and the Extension Education Division. The presidents during this phase have been Mr. Edward Yang, Mr. Chang Hsiao-Tzu, and Dr. Liu Yuan-Tsun. They purchased some more land for campus extension purposes, added academic buildings, and further promoted the academic achievements of the school, expanding academic exchanges with higher educational institutions around the globe. Soochow University has now truly become an outstanding and well-established university, having its unique characteristics. These years, many regional alumni associations and graduate associations of different departments, at home and abroad, and then the Alumni Contact Center in the school, have been established. In 2000, Soochow University celebrated the centennial anniversary of the school’s foundation, with its sister university in Suzhou, China. Dr. Liu Chao-Shiuan became the President in August 2004, and has since positioned Soochow University as a "first-rate teaching university.” The following year, and for the next four consecutive years, we were awarded more than 100 million of grants yearly from the "Teaching Excellence Project” by the Ministry of Education. This school has been widely recognized for the accomplishment of our teaching and learning. In March 2008, constructions of the first and second academic buildings on Waishuanghsi campus were completed. In October of the same year, Dr. Huang Jheng-Tai became the President, initiating a series of program on campus hardware and software enhancement. The highlights include "Safe, Secured, and Cozy Campus”, "Self-Respecting and Respectful People”, and "Reciprocal and Integrated Research Projects”. On the well-established basis of teaching excellence, plus our characteristic research, we aim at breeding pillar talents who will be both professionals and leaders in our society. In March 2012, Dr. Pan, Wei Ta has taken over as the President. To face the next decade of the new century, this university will carry on the well-founded tradition of upholding a well-rounded education. We continue to strive for enhancing competiveness and global perspectives for students of Soochow University. We are establishing our international visibility through various exchange and cooperation programs. In taking firm foothold and ascending the peak, we move, in steady pace, onward on the path of becoming a first-class university.